Pack of 1 JCB 3V CR2032 Battery. JCB CR2032 specialist button batteries are high capacity batteries and are suitable for a wide variety of electronic devices such as watches, calculators, clocks, torches, car keys, toys and more. JCB as a brand are known for their reliability and heavy duty and these button batteries have been developed to be as good as the leading brand brand and last far longer than cheaper CR2032 button batteries on the market. >CR2016 3V Button Battery Pack of 1 JCB CR2016 - 3V Battery. JCB CR2016 specialist batt..
CR2025 3V Button Battery Pack of 1 JCB 3V CR2025 Battery. JCB CR2025 specialist batteries ar..
LR44 1.5V Button Battery - 2 Pack Pack of 2 x JCB LR44 - 1.5V Battery. 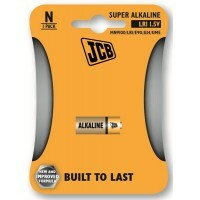 JCB LR44 specialist..
CR2025 3V Button Battery Pack of 1 Contour 3V CR2025 Battery. These Contour high capacity ..
CR2032 3V Button Battery Pack of 1 Contour 3V CR2032 Battery. These Contour CR2032 button ..
LR1 1.5V Battery Pack of 1 JCB 1.5V LR1 Battery. JCB as a brand are known for their reliab..